Today, we are going to begin coverage of a traditional operating system issue, but this time in a distributed environment: process allocation and migration. We are going to ask the question, "Given many different processors, which one do we use and when is appropriate to move to a different one?" But, before entering into that discussion, I would like to discuss some preliminary concepts relavent to distributed scheduling. So, we'll begin by looking at the economies of multiple processors, and then examine threas, processes, and tasks in a distributed setting. Which is preferable, 1 processor, or N processors, each of which is 1/Nth as powerful? Both options are equally "powerful"
1 processor is more likely to be completely functional than N processors, each of which has the same likelihood of failing as the single processor. If it is "all or nothing", this might suggest that the single processor is more robust. The N processors are less likely to completely fail than the single processor. In other words, if progress can be made with only some of the processors, the N processors are "fail soft". The surprising finding is this: The response time is better for a system with one processor than N processors which are 1/Nth as powerful. How can this be possible? Simple math shows: N*(1/N) = 1. Let's see if we can think our way through this situation. Let's begin by defining response time to be the elapsed time between the arrival of a job and the time that the last piece of the result is produced by the processor(s). Now let's assume that there is only one job in the system and that this job is indivisible and cannot be parallelized. It is fair to assume that the job cannot be divided and conquered, because any job can be reduced to a piece that is atomic. This indivisible piece is what we will now consider. Let's say that this job takes one unit of time in our one processor system. If this is the case, it will take N units of time if executed in the N processor system. The reason for this is that the job can only make use of one processor, so it can only utilize 1/Nth of the power of the N procesor system. Now if we assume that we have an endless stream of jobs, it might seem like this problem goes away -- we can make use of all of the processors concurrently. And, although this is true, it doesn't quite work out so well in practice. As each job arrives, it must be placed on the queue associated with one of the processors. Some queues may become long and other queues may be empty. The backlog that builds up on the queues that happen to be long is a penalty, whereas the unused cycles on the available processors offer no reward. If you want to try to understand the formula above, you can think of it this way. Take a look at the denominator of the equation. It subtracts the arrival rate from the service rate. In other words, it asks the question, "In each unit of time, if we execute all of the jobs we have, how many jobs worth of time is left unused?" If we have another job to submit, we must fit it into this unused time. The question then becomes, "How many units of time does it take for me to acquire enough left-over time to execute the new job?" This subtraction yields the number of fractional jobs that are left over per unit time, in this case seconds. By inverting this, we end up with the number of units of time measured that are required to execute the new job -- this includes the busy cycles that we spend waiting, and those cycles used ofr the new job. It might make sense to view this as a periodic system, where each "unit of time" is a single period. The mean response time is the mean case for many periods it wil take for use to find enough spare cycles to complete our job. The piece of each period that already used represents the cycles spent on th jobs ahead of us on the queue. Again, a quick look at this can give us some intuition about why it is true. If there are no spare cycles, the load average will be one and the denominator will be 0, yielding an infinite expected queue length. If the load average is 0, there are no jobs in the system, so the queue is empty. If the load average is 80% or 0.8, we can only use 20% or 0.2 of each period for our job. This means that if our job requires 80% of a period, we will have to wait 4 periods to acquire enough cycles, hence an expected queue length of 4. Notice the surprising result: We get an N times speedup by having one processor, instead of N processors that are each 1/Nth as powerful! It is a good thing for us that it is cheaper to by N slower processors than a processor N times as fast -- otherwise distributed and parallel systems would become less interesting (at least for the purpose of improving the response time for computationally intensive tasks). It is also a good thing for us that, looking forward, it looks like processors with lower clock rates, and that are otherwise a little less able, might be able to perform significantly more work per unit of energy input (financial and environmental cost), or heat output (ditto). Energy efficient computing might well favor many computers in place of a single bigger one. So, although distributed systems might not be useful for reducing the response times for large, indivisible tasks, they can yield more processing power for less money, less energy, greater availabilty, and greater accessibility for distributed user communities. Our discssion is going to involve picking a processor to run a process and moving that process from one processor to another when appropriate. Processor allocation involves deciding which processor should be assigned to a newly created process, and as a consequence, which system should initially host the process. In our discussion of process migration, we will discuss the costs of associated with moving a process, how to decide that a process should be migrated, how to select a new host for a process, and how to make the resources originally located at one host available at another host. Although these algorithms will be discussed in the context of processes, task with only one thread, they apply almost unaltered to tasks containing multiple threads. The reason for this is that the interaction of the multiple threads with each other and the environment almost certainly implies that the entire task, including all of its threads, should be migrated whole -- just like a single-thread process. Unlike multiprocessor computers, it only very rarely makes sense to dispatch different threads to different processors, or to migrate some threads but not others. In distributed systems, the cost of sharing resources on different hosts is usually far too high to allow for this level of independence. One interesting aspect of distributed systems is that we can choose upon which processor to dispatch a job. This decision, and the associated action of dispatching the job onto the processor, is known as processor allocation. Depending on the environment, different factors may drive our decision. For example, many environments consist largely of networks of (personal) workstations (NOWs). In these enviornments, it may be advantageous to "steal" cycles from other uses while they are away from their machines leaving them idle. This is especially attractive since some studies have shown that the typical workstation is idle approximately 70-80% of the time. Of course we would only want to do this if our own workstation is substantially busy -- otherwise we would be paying the price of shipping our job, and perhaps user interaction, &c, both ways and gaining little or nothing. It is certainly forseable that the unnecessary use of a remote processor can increase (worsen) turnaround time. In other cases, we may have pools of available "cycle servers" and underpowered personal workstations. If this is the case, we can organize our system so that it always dispatches jobs to a remote processor. But, in either case, we want to make sure that we make a careful choice about where we should send our work -- otherwise some poor machine may get smashed. Transparent processor allocation is different than simple remote execution, as might be provided by something like rhs. The biggest difference is in transparency -- the user need not known that the job is executing other than locally. The second difference is that processor allocation can lead to migration, or the movement of a job after it has begun executing. The first technique that we'll talk about is named Up-Down. The goal of the Up-Down approach tries to be somewhat fair to users in the way that it allocates processors. It does this by giving light weight users priority over "CPU hogs". Users earn points when their workstation is idle. This is, in effect, credit for allowing others to use their processor. Users lose points when they consume the idle CPU on remote hosts. The points are accrued or spent at a fixed rate. This approach assumes that a user is associated with exactly one workstation (his or her workstation). When a processor becomes avaialble, it gives it to the requestor with the greatest number of points. This favors those users who are net providers of CPU and penalizes those who are net users. In effect, it ensures that if you only need processor time occasionally, you get it right away. But, if you have used tons of CPU, you yield to those who have been less demanding recently. Obviously it is impossible for everyone to be a net consumer of CPU, since one can't use more CPU than is available. Everyone can, however be a net supplier of CPU, since it is possible for all hosts to be idle. It requires some overhead to determine where a process should be run. This overhead can grow quite large, especially if many machines are assumed to be busy. An alternative to the approach described above is to use a hierarchical approach. Instead of assuming the peer-to-peer workstation model as we did above, we are going to assume a model with many "worker" workstations, and a smaller number of "manager" workstation. We organize these workstations into a tree, with all of the workers as leaves. The leaves are then collected into groups and each group is given a manager. 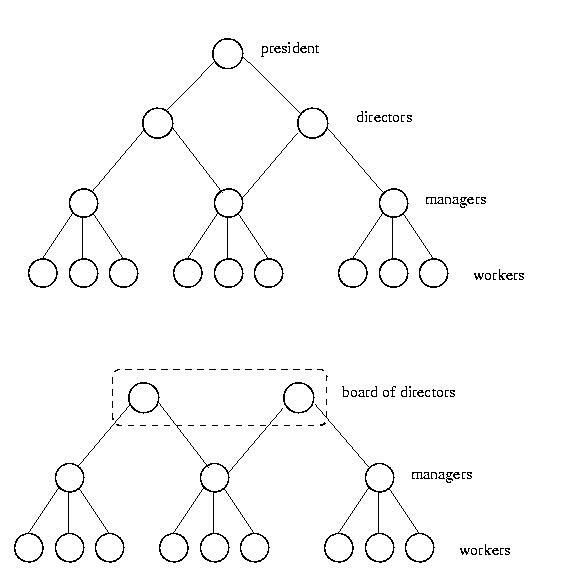 Each group of workers becomes the children of their manager in the tree. These manager's in turn are grouped together and given a directory. These directors have a common parent, which is the root of the tree. One alternative is to use a "board of directors" instead of a single root. Under this organization, a worker tries to maintain its load between a high and low watermark. If it gets too much work or too little work, it tells its manager. Its manager will then use this information to try to shift work among its workers to properly balance the load. The managers themselves have quotas. If they find themelves with either a shortage or surplus of cycles, they tell their directors, who in turn try to balance the load among their managers, and so on. If the top level is a committee, instead of a signle node, this provides for some level of fault tolerance. If each member of the committee knows everything, it may be possible for a decision to be made, even if one fails. The goal of this approach is to reduce the amount of information that must be communicated across the network in order to balance the load. If workstations are to cooperate and share work, they must somehow, directly or indirectly, communicate their work levels to each other. Obviously, this leads to a trade-off between perfect information and a tolerable level of communication. We need to have a protocol that will give us "good enough" information. One nieve approach is to have processors "yell out" to everyone when they are idle. But this approach has a big problem. If a processor "yells out" to all of the other processors, they might all send work its way. The previously idle processor suddenly is heavily loaded. Then, another processor, perhaps one that recently off-loaded work becomes idle, and "yells out". Well, that processor gets slammed with work. If a facility for process migration exists, things get even worse. This probelem is known as thundering herds. In order to solve the thundering herds problem, we can use a different form of this receiver initiated technique. Instead of broadcasting to everyone, an idle processor can "ask around". As soon as it finds work, it stops asking. If it doesn't find work after asking some fixed number of hosts, it sleeps, while waiting for more of its own work, and tries again after a dormant period, if it remains idle. This approach leasds to hevy communications overhead when the processors are mostly idle. Another and complimentary approach is known as sender initiated processor allocation. Under this approach a host which notices that its queue of waiting jobs is above some threshold level will "ask around" for help. If it can't find help after asking a fixed number of hosts, it assumes that everyone is busy and waits a while before asking again. As was the case with receiver initiated processor allocation, it is good to poll a random collection of hosts to keep things balanced. Unfortunately, this approach leads to heavy communications overhead when the processors are mostly busy. Hybrid approaches are also possible. These try to balance the costs of the above two approaches. They only "yell out" if they are substantially overworked or under worked. In other words, a processor won't yell out for help, unless it has a really, really long run queue. And it won't advertise that it has cycles available, unless it has been idle for some time. Typically, under hybrid approaches, processors can operate in both sender-initiated or receiver-initiated modes, as necessary. When processors are interconnected with each other via IPC, this becomes a consideration for processor allocation. If the processes are cooperating very heavily and cannot make progress without IPC, it might make sense to run them in parallel. Co-scheduling (Ousterhout '82) is one technique for resolving this. It schedules groups of cooperating processes to run in parallel, by useing round-robin style scheduling, and placing the cooperating processes in corresponding time slots on different processors. Another technique, known as Graph Theoretic Deterministic scheduling builds a weighted graph of all of the processes. The edges are IPC channels, weighted by the amount of communication. The basic idea is that it is best to have processes that require a great deal of IPC running on the same host, so that the latency associated with the IPC is minimized. These approaches work by partioning the graph into one subgraph for each processor in such a way as to minimize the weight of the disected edges. Although the complexity of these approaches makes them poor choices for real-world systems, they are a rich area of theoretic research. It is also common place for humans to keep IPC vs. network traffic in mind when making this type fo decision by hand. I have to confess that this approach, Ferguson, et al, in 1988, isn't the most practical, and it isn't of much theoretical significance -- but I love the free market. I can't help myself. The basic idea is that processes are given money, perhaps in accordance with their priority. They take this money and buy the resources that they need, including a processor and the communication channels to move there and back. When a processor becomes available, it holds a bid. The high bidder wins. Processes bid for a processor by checking a bulletin board to see what the processor's last selling price was. They also consider the cost of the network connection to move there and back. Once they've done that, they decide which processors they might be able to afford, and make a bid on one them. They bid on the processor that wil give them the best service (fastest clock? ), while leaving them with enough of a surplus that they can still afford to get back, if the communication channel goes up in price. They bid the last winning bid, plus a piece of the surplus that would be left over if they won the bid. This surplus is what's left over after the processor wins the bid and buys the network, &c. The surplus is important, because the network could go up in price -- the surplus may prevent the process from becoming stranded for a long time. This approach isn't very practical -- it requires a great deal of overhead. And it isn't clear to me how money should actually be handed out. But it does provide an efficient use of resources. It might also be useful in cases where resources can provide distinctly different qualities of services. In these cases, the free market system might ensure that they are allocated in an efficient way. Of course, the efficiency would have to be sufficient to justify the very high overhead of this technique -- not likely. If you've got a virtual machines and a distributed file system, you've saved some problems. The VM can migrate, moving the file sessions and internal state with it. But, depending on the VM configuration, it might or might not be able to keep its old IP address. To keep its old IP address, it has to be a public IP address assigned to it, rather than a situation where it gets a private IP address within a VPN and publicly uses the public IP of the host. It also has to migrate within the same network, so broadcasts to its MAC address still get there. And, lastly, switches and the like need to be made aware of the move, so they don't misunderstand where it is in a bridged link layer and deliver its messages to the wrong leg. VMs really can help to make migration almost transparent, especially if there exists a DFS that won't become confused by the move and the file interaction is structured as open-read/write-close transactions. But, that brings us to the hard part -- it is the external (network) interaction that is the hard part. And, VMs really can't fix this. To the extent that we can use virtual machines to abstract away the problem, that is fantastic. They might or might not be an option for reasons of efficiency, compatibility, etc. But, to the extent that they are an answer, they are often a nice, clean one. Beyond that, we've got to hide the migration within lower-level primitives. For example, we don't want our code to be filed with hacks to handle migrating TCP connections. Instead, we want to build a recoverable, migratable communications layer: one that can suspend, update, and resume. This way, our program logic is clean -- and our communications layer can hide the dirt.